SNHR has published on 2 September, 2013 a report about the destruction of hospitals across Syria; according to the report, 85% of Ar-Raqqa hospitals are either non-functioning or out of service. Der Ezzor, Damascus countryside, and Homs come second as 75% of the hospitals in these governorates are out of service. Government forces are still targeting, deliberately in most cases, the hospitals to deepen the suffering of the residents in the areas that have gotten out of the Syrian regime control. The warplanes of the Syrian regime, which is the only party in Syria that possess aerial arsenal, have targeted the department of nephrology at The National Hospital in Ar-Raqqa.Warplanes shelled, without any prior warning or declared purpose, the hospital with two missiles which destroyed the hospital heavily and killed one victim and wounded 22 people. SNHR has documented, in a previous incident, the targeting of the very same hospital by the Syrian regime, particularly the department of pediatrics on 20 June, 2013. “At 12:00 on Tuesday, I heard about the airstrike that targeted The National Hospital. The wounded were taken to the intact sections of the hospital. I went to the location to see the remains of the missiles; the first missile targeted the department of nephrology and destroyed completely half of the dialysis section –machines, furniture, and structure- in addition to partly destroying more than half of the right parts of the dialysis section. 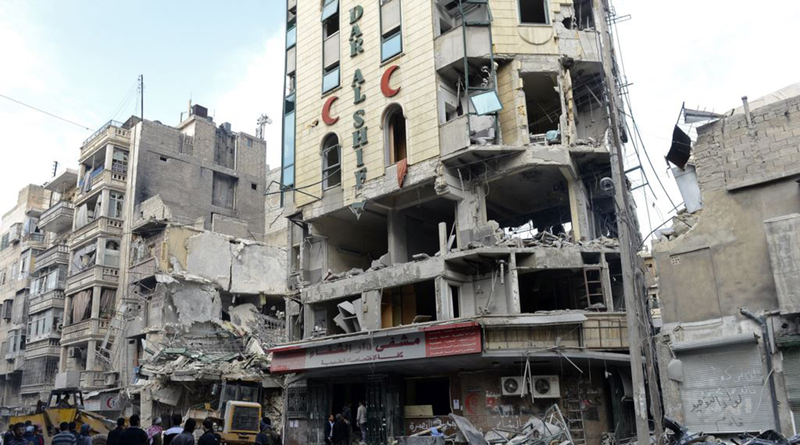 The second missile targeted the diabetes clinics and destroyed it completely- structure, machines, and furniture- and destroyed partly the doctors’ residence that was in the same hallway of the diabetes clinics. I learned on the next day that Ali Ismail As-Saaed –Abu-Hassan- has died of his wounds that he sustained during the shelling”.